When the first choirs of the heavens created the fundament of Earth by will of the High Lord, already there were a few that began to love the Earth more than the heavens. Already, they began seeing the bounty that might come from the land and the people who soon began to prosper upon it. They looked to the white clouds and white gates and white halos and knew that there was more in the world below that might be better worth their time. And, boy were they right! Delectably sinful options were suddenly available to them. Pizza, what they thought was to be the most sinful of all delightful foods became a quick passion… at least until they came upon dark chocolate. The perfect blend of savory and sweet, this mouthful of delicious candy was unlike anything in the pure and simple beauty of the high heavens. The choice was set. This place… this Earth… this bountiful location where all manner of delights could be taken.This was the angel’s desire. And, so, she cast off the pure white wings and her golden halo of purity. By no means was she ready to go to the full lengths of evil, but… a little bit of sin to mix with the saint would make her just like the dark chocolate that had so perfectly awakened her spirit. 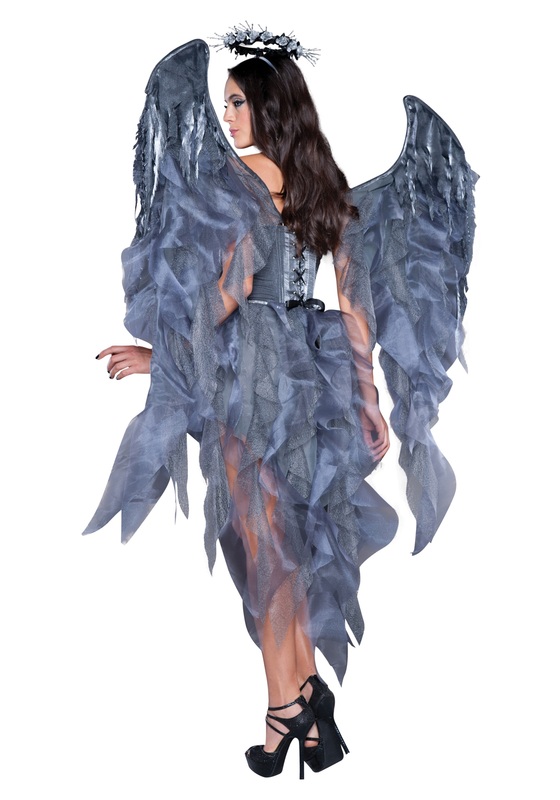 And you, too, may walk this dark and holy path with the Adult Dark Angel’s Desire costume. This strapless dress has a boned corset bodice and black ribbon accents and features layers of lace and organza along its skirt. The similar fabric forms the wings along a wire frame which slide easily into the corset. Gone are the days of boring white and gold halo. Instead, strike a fashion trend with this black and silver flower halo to show that that world and the heavens are better when you mix a little of both worlds. Now, what other delightful sins are worth exploring?